This newly built house is our "Seaview getaway". It's ideal for two people, but it can sleep four. There is a bathroom with washing machine, tumble dryer and shower. The kitchen is fully equipped, including microwave and dishwasher. 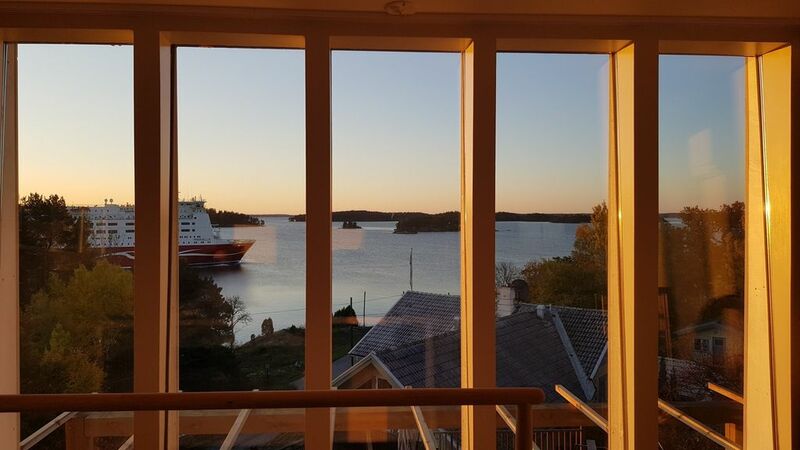 From your bedroom with a comfortable queen-size bed, you have a stunning view of the archipelago and the cruise ships just in front of you. In the evening you can also enjoy the Jacuzzi. This is a perfect place to get away, dream, rest and be part of the archipelago area in an exclusive setting. The cottage is on the mainland and easy to reach by car. There are plenty of romantic walks in the area. Bed linen, towels and bathrobes are always included. From the terrace a private staircase and a little footpath lead right down to a private pier in the Baltic See that can be used for example sun bathing, swimming or fishing. A small sandy beach can be found 100m away. We had the most amazing time in Markus’ place. It is equipped so well with everything you need and is a great size! Everything is so comfortable and lovely. The hot tub was amazing and the view is absolutely spectacular. The landscape was covered in snow while we were there which made for the most fantastic Christmas! Our friends are already asked where we stayed and we hope to be back soon!! This is a lovely, exceptionally well equipped, 2 storey light and airy apartment with fantastic views over the Archipeligo. A car is essential to properly explore the locality, and as there are no bars or shops around. You need to stop off in Akersberga for provisions.. including the alcohol store! Markhus is happy to sit down and talk through the best places to visit, walk, swim etc, and we found his tips spot on. Fantastisk utsikt, fräscht, härligt spabad och fint välkomnande! Great place, but you need to make sure that you are quiet. Perfect location and great views, however do not choose this location if you want to come with kids as kids make noise. Also suggest it is mentioned in the presentation of the property. Hello and thank you for your review for your visit last summer. As mentioned in the description of the property we always welcome infants and children above 15 years. Due to the location with staircases, archipelago rock formations and amenities like the jacuzzi, solar deck, private pier in the sea and quite exclusive materials we do not find the place too suitable for unsupervised youngsters (for their own and our sakes). Maybe the usual usage as honeymoon cottage or private getaway for one of two couples is the best answer to this. Traumhafte Landschaft, ruhige Lage, super Aussicht und ein sehr netter Gastwirt. Alles war wie es sein sollte. Unbeschränkt zu empfehlen. Wir haben in dem schönen Haus einen einwöchigen Urlaub verbracht. Die Lage war klasse ,der Vermieter sehr nett . Wir können das Ferienhaus nur weiterempfehlen. The Stockholm Archipelago is worth a visit any time of the year. Half of the 24 000 islands are uninhabited, so there are many opportunities to enjoy both nature or leisure time activities. Nogle af de større islands kan nås med bil eller bilferie, andre ved regelmæssige turistbåter. Small islands can only be reached by private boat. På de større islands finder du også restauranter, barer og strande. Many marine nature reserves guarantee the protection of this unique eco system. In wintertime you can even ice skate around the islands. Det er tilrådelig å ha en leiebil til din disposisjon.